Stylish Bedding with a Discount! Want to keep your bedroom fresh and stylish? All you need to do is change your bedding to keep up with the seasons. With summer quickly approaching, now is the time to store your winter bedding until next year and get some stylish bedding with a fresh new look. You can upgrade your room to match your mood with bright colors and fun designs and save money by doing so! How? 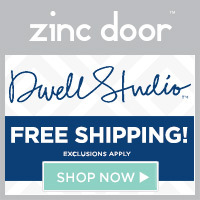 Right now, Zinc Door is offering 15% off Trina Turk bedding with promo code 15BED. It’s always a happy hour at home with Trina Turk’s fun, whimsical bedding and accents. Don’t miss your chance to save on these stylish and modern bed sets. Take a look at my favorite pick for summer bedding below. It reminds me of sitting by the pool and relaxing! Have you updated your bedding for summer yet? Now is your chance! I love the Turquoise bedding set! Pretty!